Will the 5-year jail term for Lalu Prasad help clean up Indian politics? 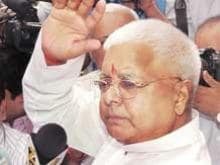 Seventeen years after the fodder scam entered the public realm, the RJD's maverick leader Lalu Prasad has been sent to jail for five years for his involvement. Will political parties now be on their toes and start cleaning up their act? Or will the sentence have no impact, given the penchant for tainted politicians to make a backdoor entry through relatives, friends, associates and stooges? Do share your views with us.